At Maverick Spring Makers Limited, we do our best to support you every step of the way. We can help you in the design of Compression, Extension and Torsion Springs. We can begin even before the RFQ process. 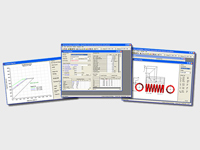 Analysis of your blueprints combined with a clear understanding of your needs allows our spring design and engineering team to help you with everything from spring material selection and pricing, to manufacturability consulting. Maverick Spring Makers Limited uses industry standard Spring Design software. We can help you optimize your spring design in order to minimize your cost, and maximize the fatigue life of the spring. To learn more about our spring engineering and design services, please contact Maverick Spring today.